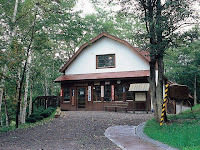 The Shiokari Pass Museum, established to commemorate one of Miura's most beloved novels, is located next to the Shiokari Toge train station on Hokkaido's Soya line, just north of Asahikawa. Shiokari Toge, the novel that made this section of the Soya line famous, is based on true events that took place there in 1909, when railway employee Masao Nagano threw himself in front of a runaway passenger train to prevent it from hurtling into the gorge. The building itself is a restoration of the house Ayako and her husband Mitsuyo lived in during the early years of their marriage, and was moved here from its original location in Asahikawa. It was while living in this house that Miura wrote her debut novel Hyoten (Freezing Point) which became a social phenomenon. The museum reproduces the conditions of Miura's daily life during those years, including the small miscellaneous goods shop she managed from the front room of their home. Click here for photos. The museum is open from the beginning of April to the end of November, every day of the week except Mondays, from 10:00 am to 4:30 pm. The admission fee is 200 yen for adults and 100 yen for children. Phone 0165-32-4088 for further information (Japanese only). Among English-speaking readers, Shiokari Pass is probably the best known and loved of Miura's works. For those who would like to learn more about this book, read the summary on the World of Miura Ayako homepage.